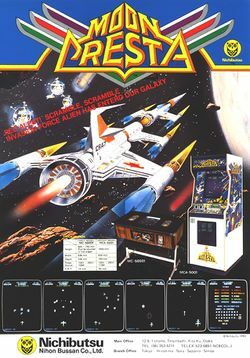 Moon Cresta is a fixed shooter arcade game that was released by Nichibutsu in 1980 and licensed to Gremlin for US manufacture and distribution; it runs on Namco's Galaxian hardware (a Zilog Z80 running at 3.072 MHz with a custom sound chip), and was one of the earliest multi-screen shooters (along with the only one to feature a "docking" system!). The eponymous "Moon Cresta" is a three-stage fighting rocket, and the player must clear the first four waves of aliens by using each stage's power separately - and if one is destroyed by alien contact (the aliens in this game do not fire), the next stage shall attempt to get through (unless, of course, it was the third one that was destroyed). After the second "Super Fly" and "Meteor" waves, you shall have thirty seconds to dock two of the stages together (by using the joystick to direct the stage which is attempting to dock left and right, and the button to slow its descent); if you fail to do it in time or crash, only the stage attempting to dock will be lost. However, if you succeed, you'll receive a bonus, and only a stage of the docked rocket hit by the aliens shall be lost after that - and if you reach 60000 points, the text of "ENJOY ANOTHER GAME" will be displayed after the last remaining stage of the rocket is destroyed and you'll get to continue from that point with another rocket. Gremlin also released an update called Super Moon Cresta, in which the player could fire quicker but the aliens could also drop bullets. This page was last edited on 30 November 2016, at 18:00.